It’s February 1st, which means it’s Game Day!! Who are you routing for – the Patriots or the Seahawks? I know with all the excitement going on, a bunch of you are still putting together last minute appetizers and dishes for the big game, including myself. Wings are always a hit amongst the guys who come over for the game, so last night I did a trial run of a new style of wings. Oh my gosh, did they come out GOOD! 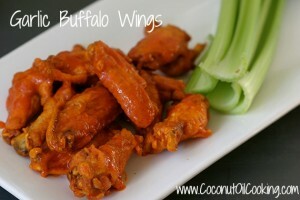 I have always been a fan of buffalo style wings, so I stuck with this and chose a garlic based sauce for an added kick. 1. Line a baking sheet with foil and spray with Kelapo Coconut Oil Cooking Spray. Next, place flour, pepper, garlic powder, and salt in a gallon size plastic bag. Shake ingredients to mix thoroughly. 2. Add about 5-8 chicken wings into the plastic bag, seal, and toss wings in mixture until completely coated with the flour mixture. Repeat this process until all wings are coated. 3. Place wings onto the prepared baking sheet and place in the refrigerator for at least 1 hour. 4. After 1 hour has passed, remove wings and preheat oven to 350 degrees F.
5. In a large bowl, whisk buffalo sauce and melted coconut oil together. Dip the wings into the mixture, coating them until covered. Bake wings until chicken is fully cooked and skin is crispy, turning the wings about 45 minutes through. Cooking time takes about 1 to 1.5 hours. Once wings are completely finished, remove them and transfer onto a serving plate. If you’re deep frying your wings, you may also use coconut oil for this process. Be sure to visit this blog for coconut oil deep frying tips. Serve wings with your favorite dipping sauce and enjoy! For more last minute Game Day entertaining ideas, our last minute dish ideas will have you covered.